Cannabinoid receptors, located throughout the body, are part of the Endocannabinoid system which is involved in a variety of physiological processes including appetite, pain-sensation, mood, and memory. Cannabinoid receptors are of a class of cell membrane receptors under the G protein-coupled receptor superfamily. 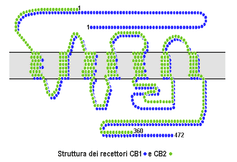 As is typical of G protein-coupled receptors, the cannabinoid receptors contain seven transmembrane spanning domains. Cannabinoid receptors are activated by three major groups of ligands: endocannabinoids, produced by the mammillary body; plant cannabinoids (such as Cannabidiol, produced by the cannabis plant); and synthetic cannabinoids (such as HU-210). All of the endocannabinoids and plant cannabinoids are lipophilic, such as fat soluble compounds. Cannabinoid receptor type 1 (CB1) receptors are thought to be one of the most widely expressed G protein-coupled receptors in the brain. This is due to endocannabinoid-mediated depolarization-induced suppression of inhibition, a very common form of short-term plasticity in which the depolarization of a single neuron induces a reduction in GABA-mediated neurotransmission. Endocannabinoids released from the depolarized post-synaptic neuron bind to CB1 receptors in the pre-synaptic neuron and cause a reduction in GABA release. A 2004 study suggested that the endocannabinoids and their cannabinoid receptors play a major role during pre- and postnatal development. In another recent study a group of researchers combined stochastic optical reconstruction microscopy (STORM) and patch clamp in order to see CB1 distribution on a nano scale with incredible resolution. CB2 receptors are mainly expressed on T cells of the immune system, on macrophages and B cells, and in hematopoietic cells. They also have a function in keratinocytes. They are also expressed on peripheral nerve terminals. These receptors play a role in antinociception, or the relief of pain. In the brain, they are mainly expressed by microglial cells, where their role remains unclear. While the most likely cellular targets and executors of the CB2 receptor-mediated effects of endocannabinoids or synthetic agonists are the immune and immune-derived cells (e.g. leukocytes, various populations of T and B lymphocytes, monocytes/macrophages, dendritic cells, mast cells, microglia in the brain, Kupffer cells in the liver, etc. ), the number of other potential cellular targets is expanding, now including endothelial and smooth muscle cells, fibroblasts of various origins, cardiomyocytes, and certain neuronal elements of the peripheral or central nervous systems. The existence of additional cannabinoid receptors has long been suspected, due to the actions of compounds such as abnormal cannabidiol that produce cannabinoid-like effects on blood pressure and inflammation, yet do not activate either CB1 or CB2. Recent research strongly supports the hypothesis that the N-arachidonoyl glycine (NAGly) receptor GPR18 is the molecular identity of the abnormal cannabidiol receptor and additionally suggests that NAGly, the endogenous lipid metabolite of anandamide (also known as arachidonoylethanolamide or AEA), initiates directed microglial migration in the CNS through activation of GPR18. Other molecular biology studies have suggested that the orphan receptor GPR55 should in fact be characterised as a cannabinoid receptor, on the basis of sequence homology at the binding site. Subsequent studies showed that GPR55 does indeed respond to cannabinoid ligands. This profile as a distinct non-CB1/CB2 receptor that responds to a variety of both endogenous and exogenous cannabinoid ligands, has led some groups to suggest GPR55 should be categorized as the CB3 receptor, and this re-classification may follow in time. However this is complicated by the fact that another possible cannabinoid receptor has been discovered in the hippocampus, although its gene has not yet been cloned, suggesting that there may be at least two more cannabinoid receptors to be discovered, in addition to the two that are already known. GPR119 has been suggested as a fifth possible cannabinoid receptor. Cannabinoid receptors are activated by cannabinoids, generated naturally inside the body (endocannabinoids) or introduced into the body as cannabis or a related synthetic compound. Inhibition of gastrointestinal activity has been observed after administration of Δ9-THC, or of anandamide. This effect has been assumed to be CB1-mediated since the specific CB1 antagonist SR 141716A (Rimonabant) blocks the effect. Recent studies have also suggested that activation of CB1 receptors in human and rodent cardiomyocytes, coronary artery endothelial and inflammatory cells promotes activation of mitogen-activated protein (MAP) kinases p38 and JNK, reactive oxygen species generation, cell death, and cardiovascular inflammatory response both in vitro, as well as in models of heart failure, atherosclerosis and vascular inflammation. The endocannabinoid system through CB2 signaling plays a key role in the maintenance of bone mass. CB2 is expressed in osteoblasts, osteocytes, and osteoclasts. CB2 agonists enhance endocortical osteoblast number and activity while restraining trabecular osteoclastogenesis. Another important effect is that CB2 agonists attenuates ovariectomy-induced bone loss while increasing cortical thickness. These findings suggest CB2 offers a potential molecular target for the diagnosis and treatment of osteoporosis. Cannabis preparations have been known as therapeutic agents against various diseases for millennia. The psychoactive compound tetrahydrocannabinol (THC) was found to be the principal mediator of the effects of cannabis. Synthetic THC is prescribed today, under the INN dronabinol or the brand name Marinol, to treat vomiting and for enhancement of appetite, mainly in AIDS patients. Several synthetic cannabinoids have been shown to bind to the CB2 receptor with a higher affinity than to the CB1 receptor. Most of these compounds exhibit only modest selectivity. One of the described compounds, a classical THC-type cannabinoid, L-759,656, in which the phenolic group is blocked as a methyl ether, has a CB1/CB2 binding ratio > 1000. The pharmacology of these agonists has yet to be described. Certain tumors, especially gliomas, express CB2 receptors. CB2 selective agonists are effective in the treatment of pain, inflammatory diseases (in animal models), osteoporosis and atherosclerosis. CB1 selective antagonists have previously been used for weight reduction and smoking cessation (see Rimonabant). Activation of CB1 provides neuroprotection after brain injury. ↑ Aizpurua-Olaizola, Oier; Elezgarai, Izaskun; Rico-Barrio, Irantzu; Zarandona, Iratxe; Etxebarria, Nestor; Usobiaga, Aresatz. "Targeting the endocannabinoid system: future therapeutic strategies". Drug Discovery Today. doi:10.1016/j.drudis.2016.08.005. ↑ Howlett AC (August 2002). "The cannabinoid receptors". Prostaglandins Other Lipid Mediat. 68-69: 619–31. doi:10.1016/S0090-6980(02)00060-6. PMID 12432948. ↑ Mackie K (May 2008). "Cannabinoid receptors: where they are and what they do". J. Neuroendocrinol. 20 Suppl 1: 10–4. doi:10.1111/j.1365-2826.2008.01671.x. PMID 18426493. ↑ Graham ES, Ashton JC, Glass M (2009). "Cannabinoid receptors: a brief history and "what's hot"". Front. Biosci. 14 (14): 944–57. doi:10.2741/3288. PMID 19273110. 1 2 Sylvaine G, Sophie M, Marchand J, Dussossoy D, Carriere D, Carayon P, Monsif B, Shire D, LE Fur G, Casellas P (1995). "Expression of Central and Peripheral Cannabinoid Receptors in Human Immune Tissues and Leukocyte Subpopulations". Eur J Biochem. 232 (1): 54–61. doi:10.1111/j.1432-1033.1995.tb20780.x. PMID 7556170. ↑ Gérard CM, Mollereau C, Vassart G, Parmentier M (1991). "Molecular cloning of a human cannabinoid receptor which is also expressed in testis". Biochem. J. 279 (Pt 1): 129–34. doi:10.1042/bj2790129. PMC 1151556 . PMID 1718258. 1 2 Pacher P, Mechoulam R (2011). "Is lipid signaling through cannabinoid 2 receptors part of a protective system?". Prog Lipid Res. 50 (2): 193–211. doi:10.1016/j.plipres.2011.01.001. PMC 3062638 . PMID 21295074. 1 2 Ryberg E, Larsson N, Sjögren S, Hjorth S, Hermansson NO, Leonova J, Elebring T, Nilsson K, Drmota T, Greasley PJ (2007). "The orphan receptor GPR55 is a novel cannabinoid receptor". Br. J. Pharmacol. 152 (7): 1092–1101. doi:10.1038/sj.bjp.0707460. PMC 2095107 . PMID 17876302. 1 2 Latek, D; Kolinski, M; Ghoshdastider, U; Debinski, A; Bombolewski, R; Plazinska, A; Jozwiak, K; Filipek, S (2011). "Modeling of ligand binding to G protein coupled receptors: Cannabinoid CB1, CB2 and adrenergic β 2 AR". Journal of Molecular Modeling. 17 (9): 2353–66. doi:10.1007/s00894-011-0986-7. PMID 21365223. ↑ Kyrou I, Valsamakis G, Tsigos C (November 2006). "The endocannabinoid system as a target for the treatment of visceral obesity and metabolic syndrome". Ann. N. Y. Acad. Sci. 1083: 270–305. doi:10.1196/annals.1367.024. PMID 17148745. ↑ Osei-Hyiaman D, DePetrillo M, Pacher P, Liu J, Radaeva S, Bátkai S, Harvey-White J, Mackie K, Offertáler L, Wang L, Kunos G (2005). "Endocannabinoid activation at hepatic CB1 receptors stimulates fatty acid synthesis and contributes to diet-induced obesity". J. Clin. Invest. 115 (5): 1298–305. doi:10.1172/JCI23057. PMC 1087161 . PMID 15864349. ↑ The Endocannabinoid-CB Receptor System: Importance for development and in pediatric disease Neuroendocrinology Letters Nos.1/2, Feb-Apr Vol.25, 2004. ↑ "Cell-specific STORM super-resolution imaging reveals nanoscale organization of cannabinoid signaling". Nature Neuroscience. 18: 75–86. doi:10.1038/nn.3892. ↑ Járai Z, Wagner JA, Varga K, Lake KD, Compton DR, Martin BR, Zimmer AM, Bonner TI, Buckley NE, Mezey E, Razdan RK, Zimmer A, Kunos G (November 1999). "Cannabinoid-induced mesenteric vasodilation through an endothelial site distinct from CB1 or CB2 receptors". Proc. Natl. Acad. Sci. U.S.A. 96 (24): 14136–41. doi:10.1073/pnas.96.24.14136. PMC 24203 . PMID 10570211. ↑ McHugh D, Tanner C, Mechoulam R, Pertwee RG, Ross RA (February 2008). "Inhibition of human neutrophil chemotaxis by endogenous cannabinoids and phytocannabinoids: evidence for a site distinct from CB1 and CB2". Mol. Pharmacol. 73 (2): 441–50. doi:10.1124/mol.107.041863. PMID 17965195. ↑ McHugh D; Hu SS-J; Rimmerman N; Juknat A; Vogel Z; Walker JM; Bradshaw HB (March 2010). "N-arachidonoyl glycine, an abundant endogenous lipid, potently drives directed cellular migration through GPR18, the putative abnormal cannabidiol receptor". BMC Neuroscience. 11: 44. doi:10.1186/1471-2202-11-44. PMC 2865488 . PMID 20346144. ↑ Johns DG, Behm DJ, Walker DJ, Ao Z, Shapland EM, Daniels DA, Riddick M, Dowell S, Staton PC, Green P, Shabon U, Bao W, Aiyar N, Yue TL, Brown AJ, Morrison AD, Douglas SA (November 2007). "The novel endocannabinoid receptor GPR55 is activated by atypical cannabinoids but does not mediate their vasodilator effects". Br. J. Pharmacol. 152 (5): 825–31. doi:10.1038/sj.bjp.0707419. PMC 2190033 . PMID 17704827. ↑ Overton HA, Babbs AJ, Doel SM, Fyfe MC, Gardner LS, Griffin G, Jackson HC, Procter MJ, Rasamison CM, Tang-Christensen M, Widdowson PS, Williams GM, Reynet C (March 2006). "Deorphanization of a G protein-coupled receptor for oleoylethanolamide and its use in the discovery of small-molecule hypophagic agents". Cell Metab. 3 (3): 167–75. doi:10.1016/j.cmet.2006.02.004. PMID 16517404. ↑ de Fonseca FR, Schneider M (June 2008). "The endogenous cannabinoid system and drug addiction: 20 years after the discovery of the CB1 receptor" (PDF). Addict Biol. 13 (2): 143–6. doi:10.1111/j.1369-1600.2008.00116.x. PMID 18482429. ↑ Brown AJ (November 2007). "Novel cannabinoid receptors". Br. J. Pharmacol. 152 (5): 567–75. doi:10.1038/sj.bjp.0707481. PMC 2190013 . PMID 17906678. 1 2 Demuth DG, Molleman A (2006). "Cannabinoid signalling". Life Sci. 78 (6): 549–63. doi:10.1016/j.lfs.2005.05.055. PMID 16109430. 1 2 Mukhopadhyay P, Bátkai S, Rajesh M, Czifra N, Harvey-White J, Haskó G, Zsengeller Z, Gerard NP, Liaudet L, Kunos G, Pacher P (2007). "Pharmacological Inhibition of CB1 Cannabinoid Receptor Protects Against Doxorubicin-Induced Cardiotoxicity". J Am Coll Cardiol. 50 (6): 528–36. doi:10.1016/j.jacc.2007.03.057. PMC 2239316 . PMID 17678736. 1 2 Mukhopadhyay P, Rajesh M, Bátkai S, Patel V, Kashiwaya Y, Liaudet L, Evgenov OV, Mackie K, Haskó G, Pacher P (2010). "CB1 cannabinoid receptors promote oxidative stress and cell death in murine models of doxorubicin-induced cardiomyopathy and in human cardiomyocytes". Cardiovasc Res. 85 (4): 773–784. doi:10.1093/cvr/cvp369. PMC 2819835 . PMID 19942623. ↑ Han KH, Lim S, Ryu J, Lee CW, Kim Y, Kang JH, Kang SS, Ahn YK, Park CS, Kim JJ (2009). "CB1 and CB2 cannabinoid receptors differentially regulate the production of reactive oxygen species by macrophages". Cardiovasc Res. 84 (3): 378–86. doi:10.1093/cvr/cvp240. PMID 19596672. 1 2 Sugamura K, Sugiyama S, Nozaki T, Matsuzawa Y, Izumiya Y, Miyata K, Nakayama M, Kaikita K, Obata T, Takeya M, Ogawa H (2009). "Activated endocannabinoid system in coronary artery disease and antiinflammatory effects of cannabinoid 1 receptor blockade on macrophages". Circulation. 119 (1): 28–36. doi:10.1161/CIRCULATIONAHA.108.811992. PMID 19103987. 1 2 Mukhopadhyay P, Horváth B, Rajesh M, Matsumoto S, Saito K, Bátkai S, Patel V, Tanchian G, Gao RY, Cravatt BF, Haskó G, Pacher P (2011). "Fatty acid amide hydrolase is a key regulator of the endocannabinoid-induced myocardial tissue injury". Free Radic Biol Med. 50 (1): 179–195. doi:10.1016/j.freeradbiomed.2010.11.002. PMC 3022384 . PMID 21070851. 1 2 3 Ofek O, Karsak M, Leclerc N, Fogel M, Frenkel B, Wright K, Tam J, Attar-Namdar M, Kram V, Shohami E, Mechoulam R, Zimmer A, Bab I (January 2006). "Peripheral cannabinoid receptor, CB2, regulates bone mass". Proc. Natl. Acad. Sci. U.S.A. 103 (3): 696–701. doi:10.1073/pnas.0504187103. PMC 1334629 . PMID 16407142. ↑ Pacher P, Bátkai S, Kunos G (2006). "The Endocannabinoid System as an Emerging Target of Pharmacotherapy". Pharmacol. Rev. 58 (3): 389–462. doi:10.1124/pr.58.3.2. PMC 2241751 . PMID 16968947. ↑ Gaoni Y, Mechoulam R (1964). "Isolation, structure and partial synthesis of an active constituent of hashish". J. Am. Chem. Soc. 86 (8): 1646–1647. doi:10.1021/ja01062a046. ↑ Ashton JC, Wright JL, McPartland JM, Tyndall JD (2008). "Cannabinoid CB1 and CB2 receptor ligand specificity and the development of CB2-selective agonists". Curr. Med. Chem. 15 (14): 1428–43. doi:10.2174/092986708784567716. PMID 18537620. ↑ Ross RA, Brockie HC, Stevenson LA, Murphy VL, Templeton F, Makriyannis A, Pertwee RG (February 1999). "Agonist-inverse agonist characterization at CB1 and CB2 cannabinoid receptors of L759633, L759656 and AM630". Br. J. Pharmacol. 126 (3): 665–72. doi:10.1038/sj.bjp.0702351. PMC 1565857 . PMID 10188977. ↑ Whiteside GT, Lee GP, Valenzano KJ (2007). "The role of the cannabinoid CB2 receptor in pain transmission and therapeutic potential of small molecule CB2 receptor agonists". Curr. Med. Chem. 14 (8): 917–36. doi:10.2174/092986707780363023. PMID 17430144. ↑ Steffens S, Veillard NR, Arnaud C, Pelli G, Burger F, Staub C, Karsak M, Zimmer A, Frossard JL, Mach F (2005). "Low dose oral cannabinoid therapy reduces progression of atherosclerosis in mice". Nature. 434 (7034): 782–6. doi:10.1038/nature03389. PMID 15815632. ↑ Panikashvili D, Simeonidou C, Ben-Shabat S, Hanuš L, Breuer A, Mechoulam R, Shohami E (2001). "An endogenous cannabinoid (2-AG) is neuroprotective after brain injury". Nature. 413 (6855): 527–31. doi:10.1038/35097089. PMID 11586361. 1 2 "PDSP Database - UNC". Retrieved 11 June 2013. 1 2 3 Aung MM, Griffin G, Huffman JW, Wu M, Keel C, Yang B, Showalter VM, Abood ME, Martin BR (August 2000). "Influence of the N-1 alkyl chain length of cannabimimetic indoles upon CB1 and CB2 receptor binding". Drug Alcohol Depend. 60 (2): 133–40. doi:10.1016/S0376-8716(99)00152-0. PMID 10940540.